Are you a marketer like me ? Do you also engage in stuff like Project management ? I bet, you too must have felt the frustration of getting things done under deadline once in your career. Sometimes we just want the whole things to be done fast but there seems to be nothing that can help us out in getting the work done. Well, there are already some cool project management applications available in the market that will help you in getting your jobs done quickly. Today, I am here with such kind of a tool and add-on called Bridge24. You will find all about this add-on in this review. So without wasting more time, let's start discussing this awesome tool Bridge24. Bridge24 is Add-ons for Asana, Basecamp and Trello that extends the functionality and make your things damn faster. Bridge24 is one of the most recommended tools and add-ons which helps users getting their data and wherever they want. It provides more control over data and makes able to reach the information anywhere regardless of the time and location. 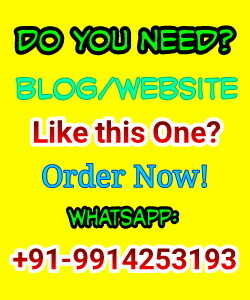 Moreover, they are continuing updating and releasing new features to keep themselves more productive in the industry. Now, I would like to talk about the features of Bridge24. This add-on comes in the list of many add-ons which have been launched recently for Aceproject, asana, trello and basecamp and carry the best enhancements. These also include a strong document preview along with everything else. The users are therefore provided with the capability to preview any sort of attached file such as ( but not limited to ) GIF, JPG, PNG and BMP with a simple click on preview icon. Users can also read pdf and HTML files as this feature allows multiple attachments that can be made just with navigation keys. Apart from the grid views that has various options like resize/hide/show options, the tool has also got a beautiful calendar view that works by putting the lists such as tasks and to-dos under the right perspective of time. The tool also equips you with one flexible view that aims in equips the project manager with overall insights and high-level perspective for creating a better and efficient schedules and therefore plan updates in case any adjustment is needed. This addon allows users to establish the best possible productivity with their apps and at the same time check their operational data within seconds. This dynamic connectivity allows the users to view & interact with the data that they get in their ( PM ) application via bridge24. This strong connectivity ensures that most recent version of data is indeed displayed in reports, views and charts. Also, if you take any action, it is reflected in the parent app. The app works greatly on improving the user experience by making use of pop-up windows, intuitive screen layouts which in turn allows for efficient access when editing tasks need to be done. There is a brand new feedback form which makes it quite easy for users to share their suggestions, comments and thoughts with the developers in an efficient manner. The tool also provides a whole new avatar window along with links and access to their latest social media information and blog. Users of basecamp and asana are now capable of viewing their task in cool to do lists after the new and awesome released view. The view came with board style layout and made it very easy to change work flow and order itself. Although trello might be on board already, this also allows users the access to Trello’s cards in the view. The support for aceproject is planned to come out soon. Connect your tools/applications to Bridge24. 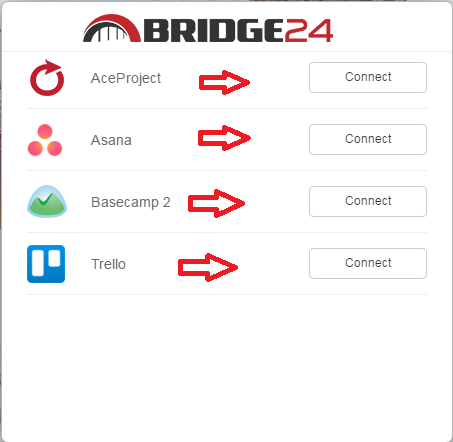 To connect your applications with Bridge24, you will have to login your existing applications and allow them to be connected. You can connect any or all of your applications including Aceproject, Asana, Basecamp 2, Trello etc.. The tool is best beneficial for project managers, operational users of Asana, Aceproject, Trello. To put it simply for those who require more access and power over their data. The whole interface of all these applications is limited and thereby don’t provide with the necessary tools for users so that he can get what exactly he needs out of his data. This tool is currently available in three languages Spanish, French, and English. This tool costs nothing. Yes, it is absolutely free of cost. If you a project manager yourself, I am sure you can relate to the whole irritating task of managing and sorting data in the manner that you want. This is the precise reason why I love using and recommend this operation management tool for those who want a perfect grip on their data. You can literally get a lot out of your data with this tool. It makes working simple for you as well as the operational user. 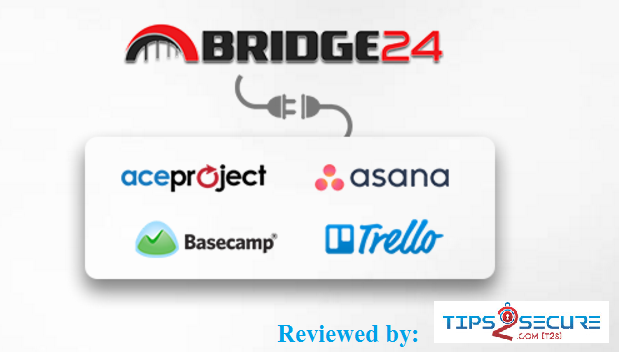 Message: I hope that you have enjoyed 'Bridge24 Review: Awesome Add-ons for Asana, Trello, Basecamp and Aceproject' article on Tips2secure. However, if you want me to deliver more items, then please share my post. You can use Social Sharing Widget provided at the end of every post. After all, Sharing is Caring!